For some, the beginning of May doesn’t just signify spring but the short-lived season of morel mushrooms. I was in high school the first time I went out foraging for these alien shaped mushrooms. I had just moved to Iowa from California and so this whole going out into the woods in search of strange fungi was foreign to me. However, the incentive of selling your harvest for $20 a pound to our local grocery store was more than enough to get me racing into deep, tick-infested wooded areas in search of the mighty morel. To be honest, the morel mushroom is a freak of nature. They “pop” for a few weeks during the early spring. Usually, when the trees start bursting in flowers of pink and white and the rains are followed by the sunshine, It’s time to forage! If you miss it, you’ll need to wait another year. I now look forward to morel mushrooms. Not just because fried morel mushrooms taste amazing, but because the hunt is so much fun and can be done with children. 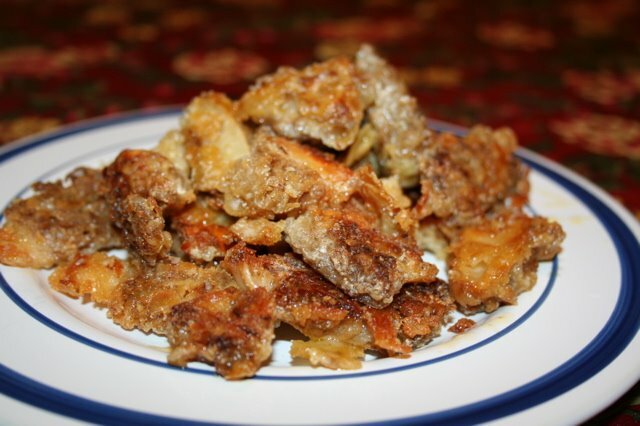 Fried morel mushrooms - the best way to eat these delectable foraged mushrooms each spring! When you bring the morel mushrooms home, you will want to slice them in half and put them in a bowl of salt water to soak for about 20 - 30 minutes. This will clean out any dirt lodged within the crevaces of the mushroom. In a saucepan, gently heat up the butter. In a ziplock bag, add some flour, salt, and the mushrooms. Toss to coat. Working in batches, fry in the butter until golden brown.